A baldachin, or baldaquin (from Italian: baldacchino), is a canopy of state typically placed over an altar or throne. It had its beginnings as a cloth canopy,[lower-alpha 1] but in other cases it is a sturdy, permanent architectural feature, particularly over high altars in cathedrals, where such a structure is more correctly called a ciborium when it is sufficiently architectural in form. 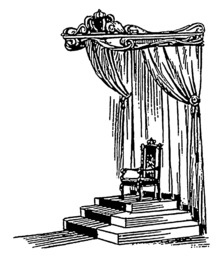 A cloth of honour is a simpler cloth hanging vertically behind the throne, usually continuing to form a canopy. 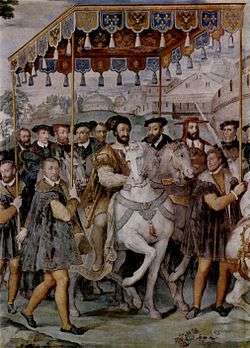 It can also be used for similar canopies in interior design, for example above beds, and for processional canopies used in formal state ceremonies such as coronations, held up by four or more men with poles attached to the corners of the cloth. The cloth was often simply a luxurious textile, often imported and with rich patterns, as in brocade]s, but might have heraldic elements. 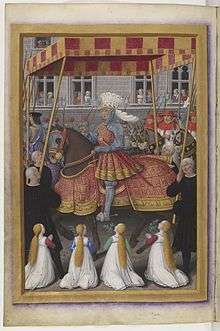 French kings are often shown with blue cloths patterned with the gold fleur-de-lys. 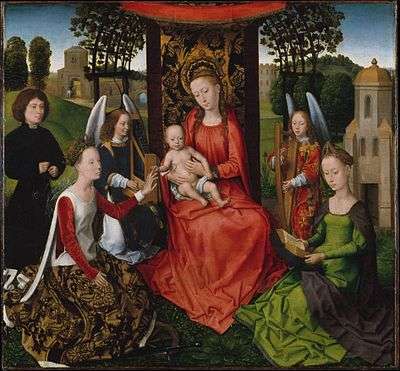 Margaret Beaufort, mother of Henry VII in her portrait by an anonymous artist, c. 1500 prays under a canopy of estate; one can see the dosser against the gilded leather wall-covering and the tester above her head (the Tudor rose at its center) supported on cords from the ceiling. The coats-of-arms embroidered or woven into the tapestry are of England (parted as usual with France) and the portcullis badge of the Beauforts. 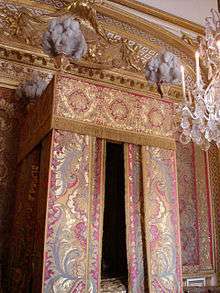 The state bed, a lit à la Duchesse—its canopy supported without visible posts— was delivered for the use of Queen Marie Leszczinska at Versailles, as the centrepiece of a new decor realized for the Queen in 1730–35. [lower-alpha 2] Its tester is quickly recognizable as a baldachin, serving its time-honoured function; the bedding might easily be replaced by a gilded throne. The queens of France spent a great deal of time in their chambre, where they received the ladies of the court at the morning lever and granted private audiences. 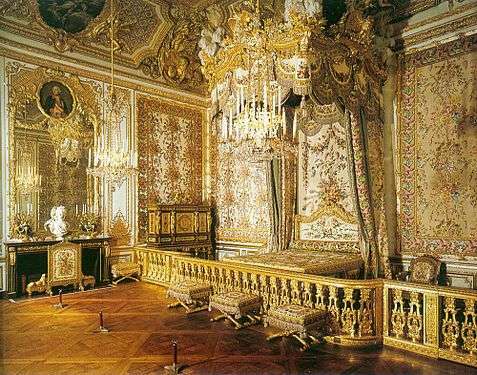 By the time Marie Antoinette escaped the mob from this bedroom, such state beds, with the elaborate etiquette they embodied, were already falling out of use. A state bed with a domed tester designed in 1775-76 by Robert Adam for Lady Child at Osterley Park[lower-alpha 3] and another domed state bed, delivered by Thomas Chippendale for Sir Edwin Lascelles at Harewood House, Yorkshire in 1773 are two of the last English state beds intended for a main floor State Bedroom in a non-royal residence. Bernini's design for the Baldachin incorporated giant solomonic columns inspired by columns that ringed the altar of the Old St. Peter's. These columns were originally donated by Constantine, and a false tradition asserts they are the columns from the Temple of Jerusalem. The lowest parts of the four columns of Bernini's Baldachin have a helical groove, and the middle and upper sections of the columns are covered in olive and bay branches, which are populated with a myriad of bees and small putti. Pope Urban VIII's family coat of arms, those of the Barberini family, with their signature bees, are at the base of every column. Francisco Franco, the ruler of Spain from 1939 to 1975, frequently walked under a baldachin after formally proclaiming Spain a monarchy--a privilege he appropriated as de facto regent for life. ↑ Baldac is a medieval Latin form for Baghdad, whence fine silks reached Europe. ↑ The hangings were rewoven for Marie Antoinette. The present hangings, made at Lyon by the same firm that delivered the originals, replicate the hangings as they were in 1787. ↑ Of this grandiose bed Horace Walpole asked in a private letter "what would Vitruvius think of a dome decorated by a milliner?" ↑ Peter K. Thornton, Authentic Decor: the Domestic Interior 1620-1920, (London, 1985) and Seventeenth-Century Interior Decoration in England, France and Holland, (New Haven & London, 1981). ↑ M. C. Miller, "The Parasol: An Oriental Status-Symbol in Late Archaic and Classical Athens," The Journal of Hellenic Studies, 112 (1992) 91-105. Peterson, John Bertram (1907). "Baldachinum of the Altar". In Herbermann, Charles. Catholic Encyclopedia. 2. New York: Robert Appleton Company.